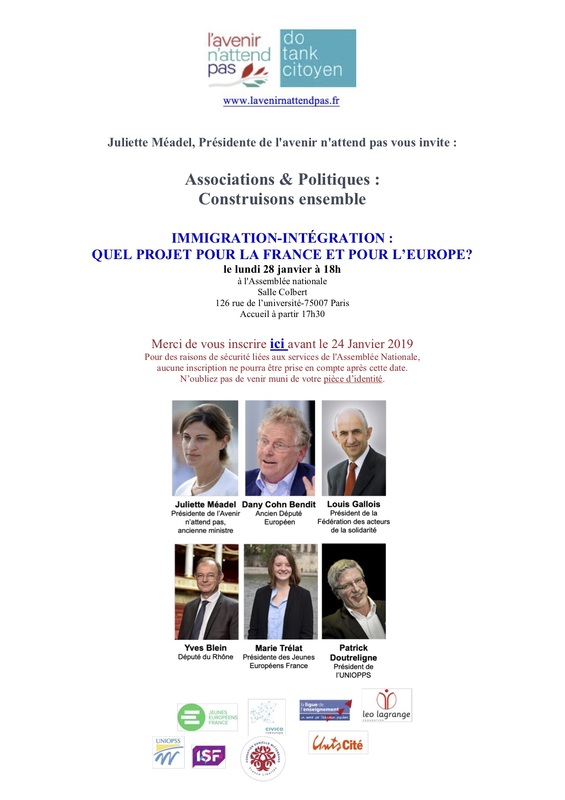 On 01/28 l'avenir n'attend pas invites you to the debate ... Europe, immigration and integration - « On n’attend pas l’avenir comme un train, on le fait! », G. Bernanos. who work to make a difference by concrete transformation – we will revitalize democracy. than on proposals to change the system. would they build to respond to these issues? debate by facilitating the expression of youth organizations and of all those who are involved in civic life. our social projects: the question of migration. you with not only the consensus but also opposing viewpoints from an initial study on the subject. Colbert), 126 rue de l’université, 75007, Paris. Register here as seating is limited. Juliette Méadel, Founder of L’Avenir n’attend pas.